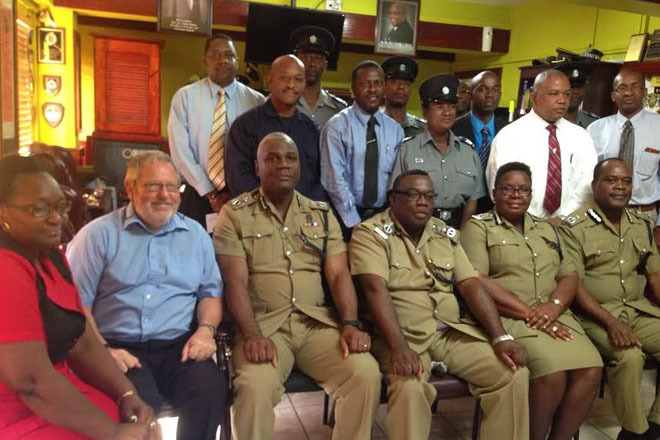 (RSCNPF): The Royal St. Christopher and Nevis Police Force is pleased to announce the confirmation of two(2) Acting Inspectors to the rank of Inspector and the promotion of eight(8) Sergeants to the rank of Inspector(Ag). Confirmed to the rank of Inspector are Inspectors Alonzo Carty and Mackie Smith effective May 01, 2016. Sgt. Lanston Jeffers. He will be transferred from the Charlestown Police Station to serve as the Station Officer at the Basseterre Police Station. Sgt. Everton Mitchum will assume command of the Office of the Professional Standards. Sgt. Reynold Myers will be transferred from duties at the Police Training Centre and assume duties as an Inspector in Division “B”. Sgt. James Stephens of the Nevis Division will assume command of the Task Force/K9 unit and will have oversight of the Traffic Department in Nevis. Sgt. John Bergan will be reassigned from the National Prosecution Unit to assume duties as an Inspector within Division “B”. W/Sgt. Eurita Collins-Percival will be transferred from the Criminal Investigations Department -Nevis to the National Prosecution Unit- Nevis. Sgt. James Francis of the National Prosecution Unit, St. Kitts will be reassigned as Inspector within the Criminal Investigations Department – St. Kitts. Sgt. Irving Bradshaw will assume Command of the Special Services Unit. Deputy Commissioner of Police Mr. Hilroy Brandy congratulated the officers and their families on behalf of the High Command and all other ranks. He encouraged them to continue to give of their best as we strive to make the federation a safer place to live, work and do business.